Earlier today, we heard news from the English press that a Uruguayan club was set to become the newest member of the City Football Group, the entity that includes Manchester City, New York City FC and Yokohama F. Marinos. No further information was disclosed other than that an announcement would come soon, however the identity of the club has been revealed by major Uruguayan source, Ovación as Club Atlético Torque. According to the article, a European business group, made up of advisers from City, have been working with Torque for some time, building a sports complex for the senior squad and another for the youth team. There are now 120 boys working with the professionals under the guidance of Ricardo Perdomo and Tony Gómez. Torque have also clarified that they will use the Estadio Juan Antonio Lavalleja in the city of Minas. Improvements are needed on the stadium but will be funded by Torque, with the new investment from the City Football Group. The idea is for Torque to rise from the Segunda to Primera División in Uruguay and become a force, with the intent to gain promotion as quickly as possible. 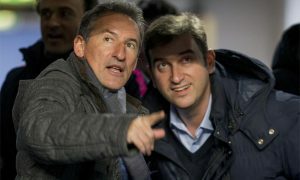 For the City Football Group, it will offer a new South American hub for commercial operations and make it much easier to attract young talents in the region, develop them in Uruguay, before taking them to Europe. A deal is very close according to Ovación and an announcement should be made soon.